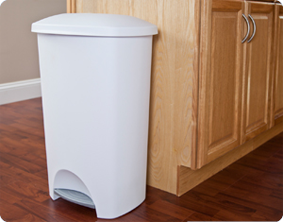 The 11 Gallon StepOn Wastebasket is an ideal solution for bigger spaces around the home or office and provides convenient, step-on access for hands-free opening. The lid helps hide contents from sight and keeps odors contained. It features polished accents and a textured surface that is easy to clean. The modern design complements any home decor and the shape fits neatly against a wall or cabinet. 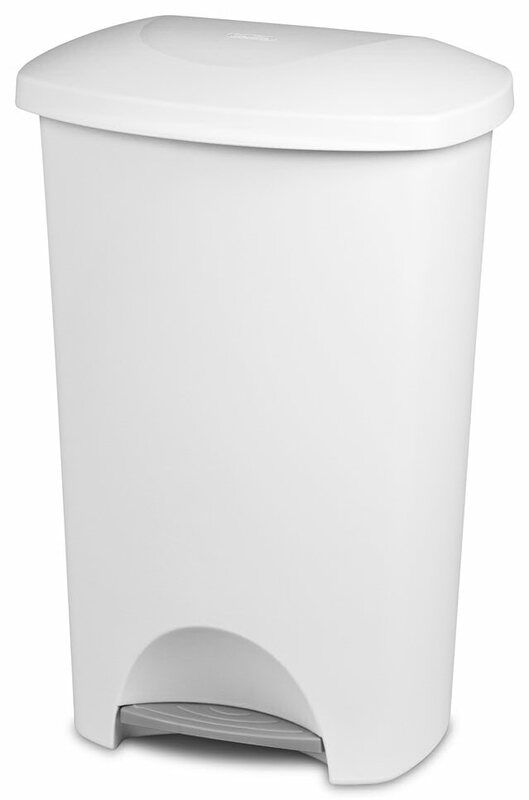 This wastebasket is ideal for use in the kitchen, garage, basement or even the office. It accommodates a standard 13-gallon trash liner or can be used to collect recyclable material. The slim profile is perfect for larger spaces and offers a generous 11 gallon capacity. 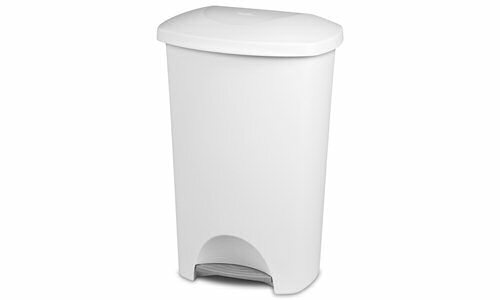 The overall dimensions of the item are 16 1/2" L 13 3/8" W x 17 3/8" H.
Overall Assembled Size: 16 1/2" x 13 3/8" x 25"
11 Gallon StepOn Wastebasket is rated 3.6 out of 5 by 12. Rated 5 out of 5 by 1froglegsDavid from An Essential Item I had never owned a trash can with a lid before, and now after having owned one, I cannot believe I ever had a trash can sitting open in my kitchen. The lid opens without fail every time I step on the lever at the bottom and closes right back to where it is supposed to. I have yet to experience the lid getting stuck in one position or another. I would prefer that the can was not tapered towards the bottom so I could maximize the amount of trash in the can, but I suppose the tapering allows the bag to be more easily removed, so I understand the logic behind the design. The plastic is very durable and cleans easily. It is definitely worth having and I intend to purchase another one. Rated 2 out of 5 by Slime from Bad Lid, useless Bought mine with the lid already attached. Got home, it fell off. No way to put it back on. I’ll but a different brand. Rated 3 out of 5 by lidproblems from Great can; terrible lid design. Have owned 2 of these cans but the lids keep breaking and no longer function as as step on to open when broken. Looked online for just a replacement lid but was unable to find the lid for purchase alone. I don't want to buy another can, can is still practically new. Rated 5 out of 5 by I'm happy with my trash can from Worth the money After i have one for 11 years and just my 16 years old son blocked one of the lips that was a good product. Rated 5 out of 5 by Home from Love this trashcan in my kitchen! I picked up this trashcan over two years ago and I still love it. I used it so much that I wore out part of the lid and was so bummed. I wrote a sad email to Sterilite and they immediately answered me and put a replacement part in the mail. Once it came in and the part was replaced, my little trashcan was back to it's useful little self. Thanks again for your awesome products and for having such amazing customer service! !